One of the most precious things a parent can teach their children is how to pray. And yet it can be one of the hardest things to teach because true prayer isn’t what’s seen, it’s what is felt. True prayer isn’t it what is said or the words you use, but in giving to God that intimate time with you. Jesus instructs his disciples how to pray in Matthew 6, and begins by telling them what NOT to do. He says not to pray like hypocrites, which just want to be seen and say lots of words. They stand in churches and on street corners and pray loudly and boldly with a “look at me – I’m talking to God!” heart. Jesus said they’ve already gotten their reward from those that see them pray. God isn’t interested in our attempts to please people in the least. He also said not to pray as heathen (non-believers) do, using repetitions and many words. He says that they feel (in their heart) that they will be heard for their many words. Some people pray the same words in the same order every time they talk to God. You can’t earn God’s presence through your fancy long speeches. I think God must feel by that the same way we do when we ask someone “How are you?” and they promptly answer “Fine, how are you?”. That’s not intimate conversation by any means. In fact, it’s not conversation – it’s just recital. Nothing is said from the heart, but only from the head. He’s not looking for who can talk the longest. What matters to Him is what matters to you. He cares what is going on in your heart because He cares for you. Then Jesus tells us how to pray. He says in Matthew 6:6 “go into your room, and when you have shut your door, pray to your Father WHO IS IN the secret place; and your Father who sees in secret will reward you openly.” God wants intimacy with you. He wants to be your only focus, your only audience. Close the door to the world, and pray to “your Father WHO IS IN the secret place”. This is where you will find God. This is where intimacy can be found with Him. He reaches out to you and says “Come away with me!” When you take time to close out the world, and focus on Him in conversation, you will find Him there. One of the things people often struggle with when praying is that feeling of talking to the air. I’ve been there, and we all go through seasons of feeling disconnected. This can be because of several things. First, if you are not saved, God can only hear one pray from you, and that is the prayer asking for salvation. John 9:31 says “Now we know that God does not hear sinners; but if anyone is a worshiper of God and does His will, He hears him.” You have to have that initial conversation with God to cleanse you of your sins. It’s as simple as telling him, in full heart-felt belief, that you believe Jesus is His son, you believe Jesus died to pay for your sins, and you want Him to come into your heart to live, and be your Savior. John 3:16 says that “whoever believes in Him should not perish but have everlasting life.” It really is that simple. You can’t do enough good to earn it. Ephesians 2:8-9 says “For by grace you have been saved through faith, and that not of yourselves; it is the gift of God, not of works, lest anyone should boast.” If we could have done enough good to earn it, Jesus would not have had to die for us. It’s a matter of putting your faith in God that Jesus is who He says He is. But it only happens from the heart, as belief in anything does. Head knowledge alone of what the Bible says about Jesus won’t grant salvation. Faith does. Secondly, for those that are saved, prayer can feel distant when you are out of fellowship with God. We’ve all had friends that we know over the years, but then something happened, and we grew apart. When we see each other that first time it’s awkward. We don’t know what to say. We don’t seem to have a “common ground”. 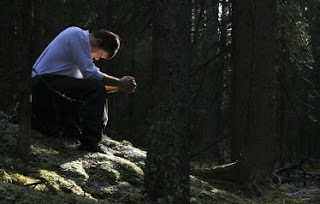 Sin can break our fellowship with God, causing us not to pray, to become estranged. Your sins – past, present, and future – are forgiven when you are saved, but they weigh down your relationship with God. Confess those sins to Him and renew that friendship. He already knows that you messed up, and has forgiven it. Confession isn’t for Him – it’s for you. Lastly, not forgiving others can break your fellowship with God as well. Matthew 6:14-15 says “For if you forgive men their trespasses, your heavenly Father will also forgive you. But if you do not forgive men their trespasses, neither will your Father forgive your trespasses.” Is there any grudge worth carrying if it keeps you from God and keeps Him from hearing your prayers? Nothing and no one is worth that. Forgive quickly! Prayer time with God isn’t like anything you can explain in human terms. It’s not like dinner with a friend, a phone conversation with someone you love, or even a quiet time with your spouse. It’s intimate on a spirit-to-Spirit level. Cherish it and value it above what the world wants to put on your schedule and you will find it to bring peace to your heart.